You were right - neither photos nor words do her justice. I won't even try. I played her this AM, and loved her sound. 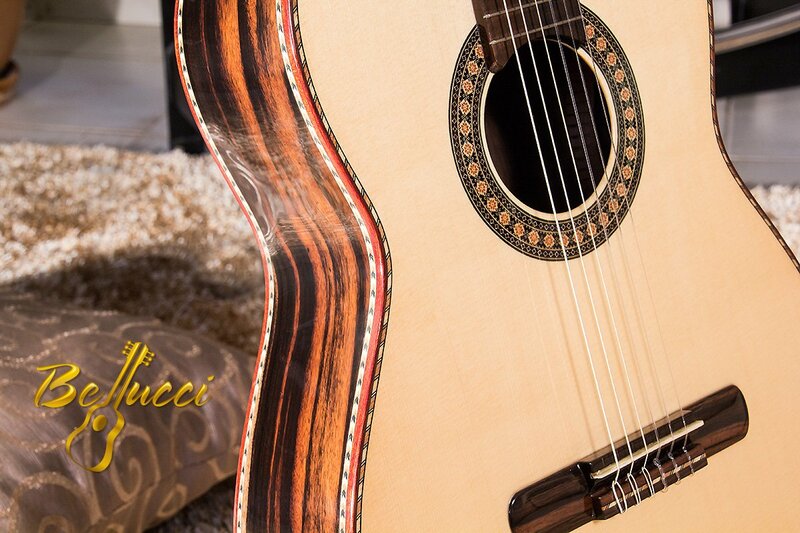 She will occupy a place in my home and in my heart with the five other Bellucci guitars I own. If I continue to visit your web site, I may ultimately run out of room in my house. I will continue to sing your praises. Thank you. The Tiger has arrived yesterday. It is a true masterpiece, very beautiful and a very clear sound! Oh my goodness. She is so beautiful I can't even believe it! You're such an amazing artist and craftsman, God has truly given you a wonderful gift. I just want you to rest assured I will take such good care of her, and I know I will enjoy playing her for the rest of my life. The wood is so gorgeous, and all the special "pretty things" you added to her, the rosette, the purfling, or trim around the edges, the tuners, everything!! Wow. My mind is completely blown. Oh yes, and also, the case. 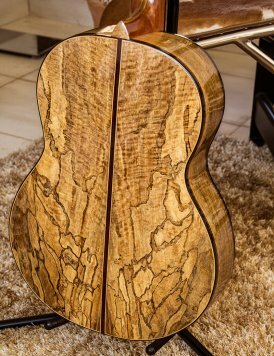 That is the most amazing case I have ever seen, truly worthy of the guitar inside. Really, I'm at a loss for words. It's everything you said she was and more!! In the future I will be back to buy more cases, I have many guitars God has blessed me with. Also, as we said before, sometime I will have you build me a custom guitar with inlay all over the place and other things, but first I must save my money. In the meantime, I will be playing this dream guitar I was so lucky to find on your website. I can't thank you enough for everything. I am truly blessed to have met you. Thank you dear Renato. I wish I could come to Paraguay and shake your hand and give you a big hug. I received and opened the Anaconda yesterday, and I am very happy with it! You and your team produce outstanding work! The case is also very beautiful. Is the case made in Paraguay as well? I have received the KK unit -for the custom Jumbo you are building for me- and will ship it out today to the address you specified. Hello Renato, I've just received my custom case. It fits my guitar perfectly! I'm incredibly happy. It is such a magnificent work of art you team has created. I'll send a photo of it later tonight with the guitar for your website. Thanks again! My Custom Blackwood Concert Guitar arrived in Japan ! I will use it all my life. Thank you. I wish to say a few words to readers and users of your website about my experience in purchasing a guitar from you. *. I made various changes and additions and back-and-forth decisions as the weeks went by, and Renato patiently took care of all those changes. What has come out really is a thing of beauty, a work of art. Initially I though of letting it sit for a few days, without playing it, so it could acclimatize itself to its surroundings, under the principle that you must not try for example a good wine immediately after it has travelled; you let it sit and compose itself from the shock it has suffered. But Natalia thought this was nonsense and tried it right away. small body or “parlor” guitars are indeed more comfortable for many of us, not just kids. far has been cooperating very nicely. Because she can feel we love her. exclusively to parlor guitars in the near future. 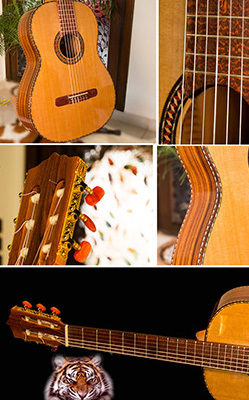 A heartfelt thank you, Renato, to you and to your luthiers for your great work and for your patience. she would be. Looks and sounds awesome, cant find one thing I don't like about her. The guitar arrived today at 2:00 PM. Shipping time was about 5 days - very fast from so far away. I have brought it up to pitch and am letting it acclimate to temperature and humidity conditions. We have just about reached the time for constant air conditioning in late spring in South Carolina. 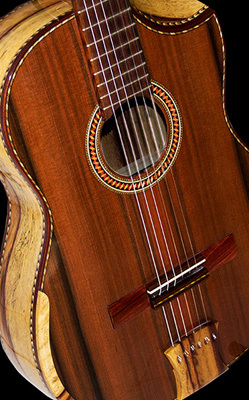 The workmanship is flawless and the cosmetic effect of the curly redwood against the very plain palette of the Indonesian Rosewood is striking. Of course, it is all tied together with the very rich but understated ornamentation. The indented cutaway is at once very useful and very beautiful. You were spot on concerning the action. In a couple of weeks I will lower it even more than you did. She will be a fine companion for my first Bellucci guitar, an 8 year old Brazilian Rosewood with a cedar nomex double top which is still my favorite. Be well, my friend; please don't ever stop leading your team in the creation of such beautiful instruments. I finally received my Zebrawood guitar today and, of course, I am much more than pleased with it. This guitar has a very mellow bass presence. That rounds out the three that I have purchased from you, quite well. As you may now know, if you in fact recall, I tend to name my guitars. I had a few preconceived notions for a name for this guitar. When I saw that you had inlayed your last name on the head of the guitar my notions changed. I will call it 'Renato', in honor of you, and I think that is altogether quite, quite fitting. Thank you so very much, once again. My kindest regards go out to you and yours. Do be well, and very well. I have been a member of your Masterclasses for almost 2 years. Becoming a member was one of the most rewarding and entertaining decisions of my life. On November 10th. 2013, my soulmate and wife (Jeannie) of 50 years passed away after a lengthy battle with cancer. During the grieving process I found that by logging onto your website I have gained tremendous comfort, peace and inspiration. Learning to play some of my wife's favorite songs has brought me closer in touch with some of our most memorable occasions. The Tiger arrived a few days ago... and in perfect order. This guitar is a man-sized instrument; seeming to favor the larger size of the several Brazilian guitars that friends of mine purchased when we were in Uruguay. This is an amazingly handsome instrument with beautiful detail, carefully executed. After we got to "know" each other a bit, the Tiger plays nicely; sounds both deep and rich/high and bright. I sense that, as she ages, her sound will constantly improve. 'Am impressed with the face; which appears to be of a relatively thinner and finer aspect. Yet the face, as well as the rest of the guitar is very solid... and weighs accordingly. I get the impression that the added overall weight, coupled with extensive underwork beneath the face, (which I have not tried to see with a mirror, nor attempted to feel through the sound opening) add strength and depth to the sounds produced by the strings, bridge and face. I wish that the tiger stripes would show on the finger board like they do on the bridge... but it wouldn't do, of course, to put such a finish on the finger board. All of the mosaic is beautifully done in various colors, set off by accompanying borders. I especially like the subtle red border around the top, around and up the back, and up the neck. I can see and feel the extra protection the plush white lining provides. The leather case is very attractive and unusual. I grew up in Phoenix Arizona and saw a lot of Mexican leatherwork, hand-tooled with the same type of designs. It appears that the decoration on the case is machine pressed, but with the same unique artistic flare of Mexico Latin America. I wonder why the placard on the inside of the guitar does not specify Asuncion Paraguay as the place of origin of the guitar. Paraguay is out-of-the-way country that must be a country of unique romance and adventure; after all, it is the home of Renato Bellucci... and who knows how may other aficionados! Thank you, Sir, for this precious treasure. This is to inform you that my beautiful cocobolo/cedar guitar is a true joy. She looks wonderful. Her sound grows more mellow each time I play her. I keep her in a humicase where the RH is 50% or more. I call her "sweetness", and I am daily more glad to have her. Your luthiers have a reason to be very proud of their product. Please accept my thanks to you and your luthiers. I received guitar today. Thank you. This guitar is very gorgeous. I will keep her always. Thank you very match Renato. Hugs!